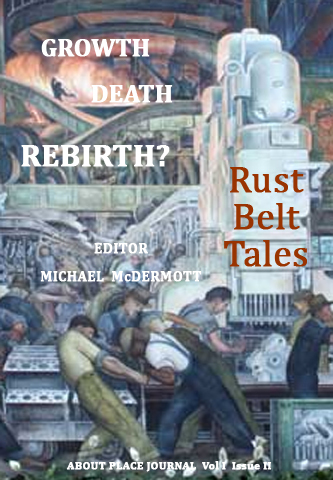 The Murals: The murals that recur in Rust Belt Tales are part of exhibit from the DetroitArtMuseum. 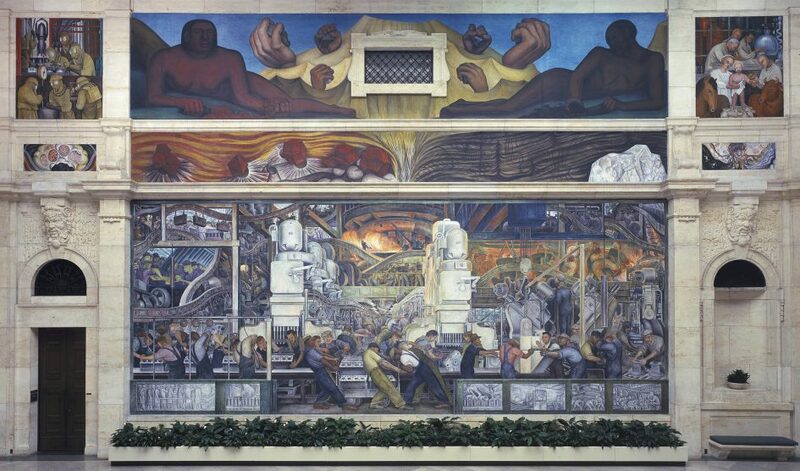 They were created by Diego Rivera as frescoes between April 1932 to March of 1933, during the several years Rivera, along with wife and fellow artist Frida Kahlo lived in Detroit. Rivera, the most well known of the Mexican muralists, was a revolutionary whose art followed but did not limit his beliefs. His art speaks out from installations around the world with many in the US and Mexico. In Detroit he showed both the power of industry and driving force of labor. His art helped to create a consciousness and culture leading to a powerful progressive and radical realignment of power in this country. Even then his work was controversial. His frescoes have been covered up (and sometimes? restored) in other parts of the country. His work in Detroit, which he considered his best, has at times been condemned but the Museum has kept the extensive installations open. Even with its obviously subversive message the greatness of the art extended beyond those who might appreciate subversion to a much broader public. Rivera and his work inspire artists in our time. We are grateful to the Detroit Institute of Art for their permission and assistance in bringing these images of the Murals to this issue; and to Mary Ann Sullivan at Bluffton University who graciously allows use of her extensive photographs of the Rivera murals through the Bluffton website. 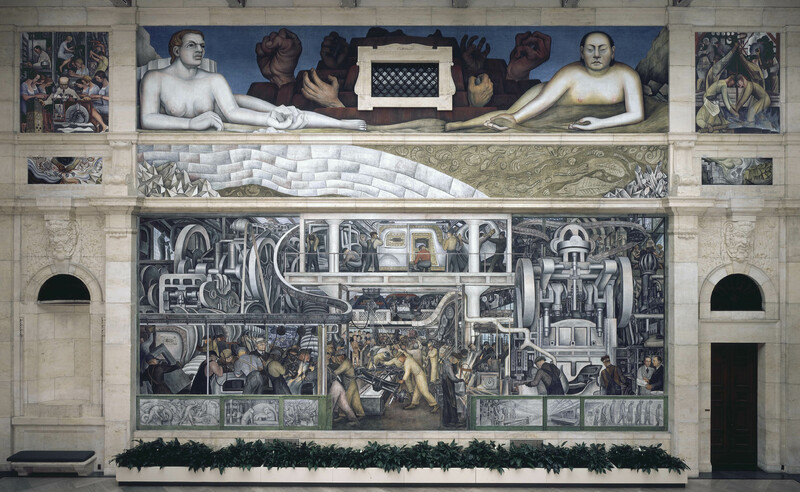 “The DIA has been a beacon of culture for the Detroit area for well over a century. Founded in 1885, the museum was originally located on Jefferson Avenue, but, due to its rapidly expanding collection, moved to a larger site on Woodward Avenue in 1927. The new Beaux-Arts building, designed by Paul Cret, was immediately referred to as the “temple of art.” Two wings were added in the 1960s and 1970s, and a major renovation and expansion that began in 1999 was completed in 2007.
the top six in the United States. The DIA’s collection is among the top six in the United States, comprising a multicultural and multinational survey of human creativity from prehistory through the 21st century. The foundation was laid by William Valentiner, a scholar and art historian from Berlin, who was director from 1924 to 1945 . His extensive contacts in Europe, along with support from generous patrons, enabled him to acquire many important works that established the framework of today’s collections. Among the notable acquisitions during his tenure are Mexican artist Diego Rivera’s Detroit Industry fresco cycle, which Rivera considered his most successful work, and Vincent van Gogh’s Self Portrait, the first Van Gogh painting to enter a U.S. museum collection. 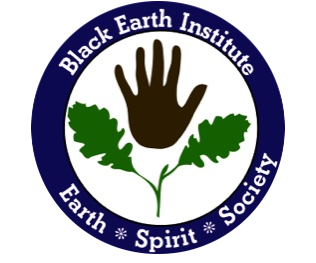 Be sure to visit them online for more information about the Detroit Industry Murals.